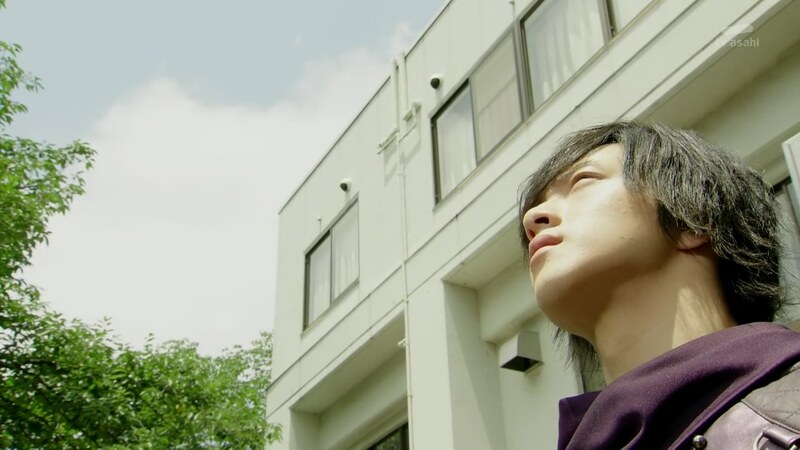 Recap: Kamen Rider Drive, Episode 44 – Who Had Loved Heart the Most? Brain has managed to get away and logs into Medic’s programming only to find something very curious. And speaking of, Medic appears behind him. Brain starts to run, but stops and instead surrenders. Gou and Chase are on their way to see Kiriko in the hospital. But they spot Shinnosuke first, creeping around with flowers and cake. Trying to play it off, he gives all the presents to Chase, grabs Gou and they leave. Over at the Special Situations Defense Center aka SSDC, Chief Jun, Otta and Rinna are updating Togama on the impending global Global Freeze. 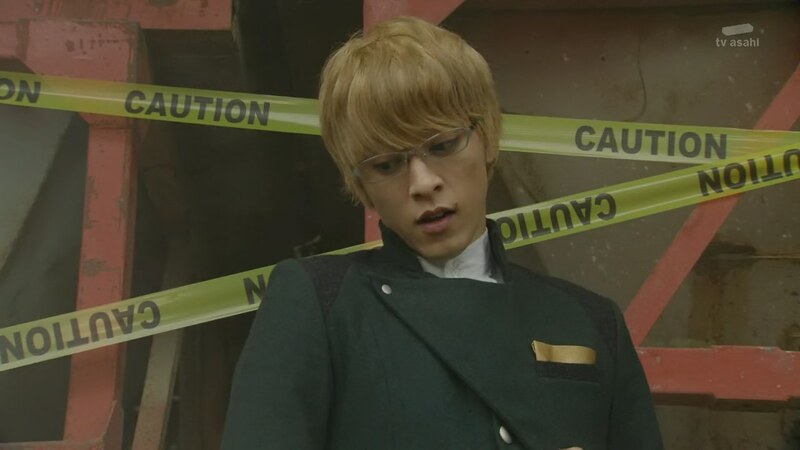 They also preview the mass produced PikoPiko by having Chief Jun henshin into Kamen Rider… Jun! 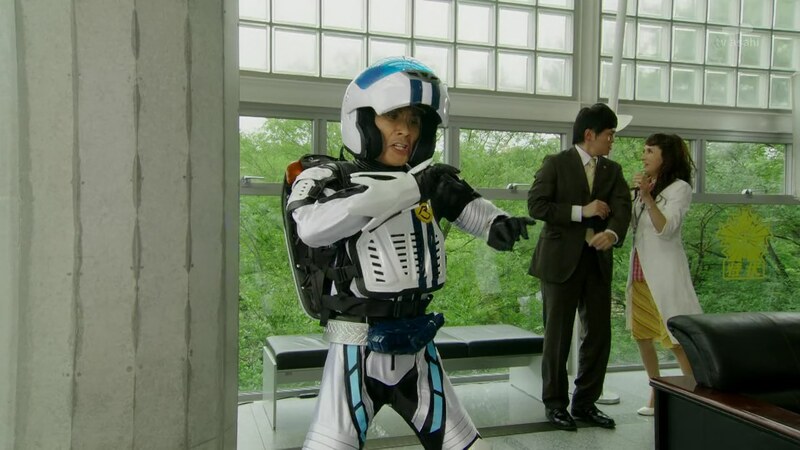 But there’s still some kinks to work out as Chief Jun can’t move in the suit at all. Meanwhile, Kiriko thanks Chase for bringing flowers like she did for him in that old, dark, abandoned hospital before. She starts eating the cake just as Chase has a very important question for her: Do you love Shinnosuke? The question takes Kiriko by surprise and she instantly becomes flustered. Chase notices it is the same reaction Shinnosuke had when he posed the question to him. He now understands. But Chase is actually proud to be feeling such emotions as this means he’s closer to being human. Looking up at the sky, he understands that the bonds people forge with each other is also love. 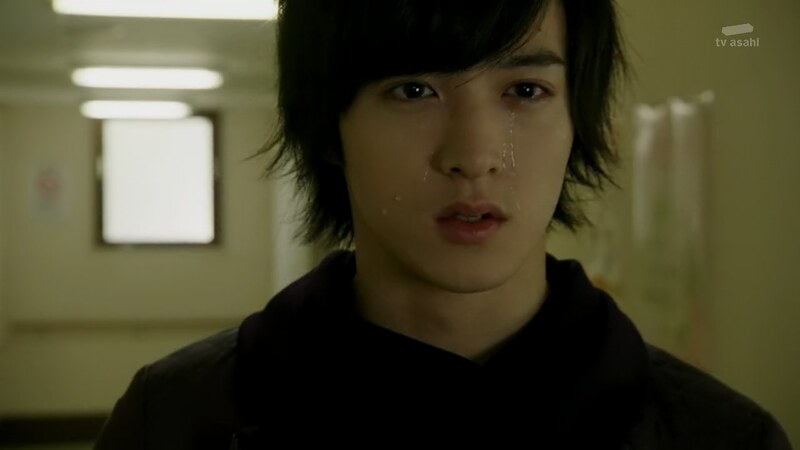 And he vows to fight and protect his love for Kiriko. The city has been put under a State of Emergency as the SSDC and SID try to search for the Promised Land. Back at the Pit, Rinna and Kyu are frantically making more PikoPikos. Across town, Heart cannot believe Brain gave himself up to Banno. Banno makes a point to remind Heart of his place in the group. 004 shows them all the Sigma Circular, the device that will reduce the risk when they draw out their Ultimate Evolution power while initiating the Global Freeze. Heart is heartbroken since he never thought Brain would betray him like this. Brain laughs that he is smart, unlike Heart. As they all head to the Promised Land, Brain takes his handkerchief out and tosses it saying Roidmude do not sweat. It is time for him to act like a ruthless machine once again. Over in Tridoron, Belt-san tells Shinnosuke how he’s been shipping him with Kiriko this entire time. That makes Shinnosuke very happy. But Belt-san is not sure he’ll be able to see the day they are together. Chief Jun calls to tell them the Promised Land has been found. The Roidmude gather in Israel by some lake. Shinnosuke, Gou and Chase join Otta and a bunch of SSDC forces hidden around the area. Otta says they found the place thanks to a tip from Mr. X. The Promised Number gather at the front and Banno floats the Sigma Circular over the water. Heart knows nothing good will come out of this, but he has no choice but to go along with it. 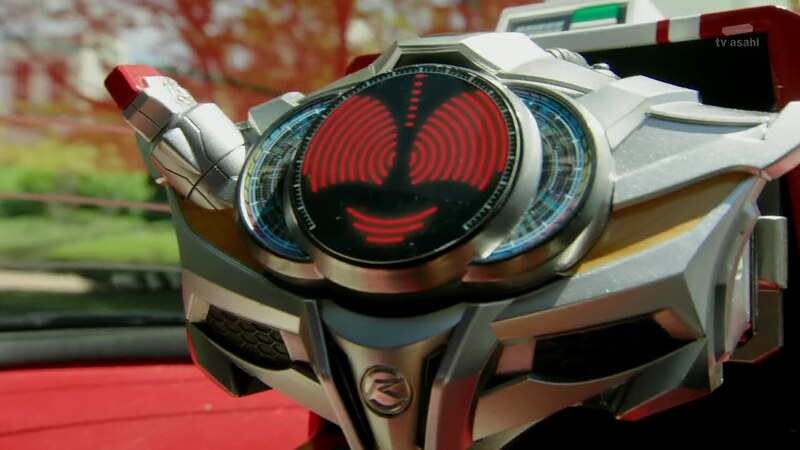 Heart, Brain and Medic all go Ultimate and with Banno, power up the Sigma Circular. 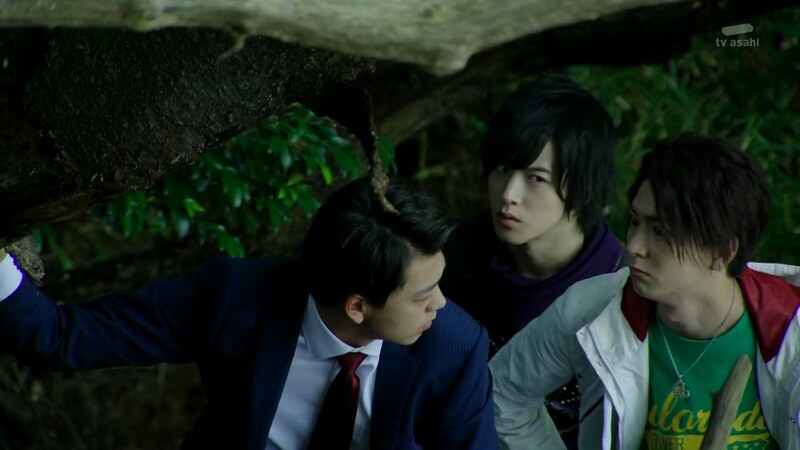 Shinnosuke, Gou and Chase henshin and they try to stop them. 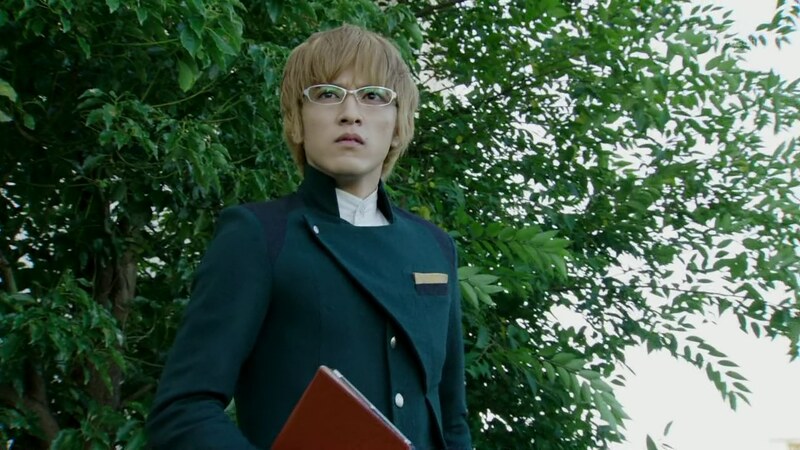 The low-level Roidmude protect the Promised Number as they continue their power transfer. 004 faces off against Shinnosuke and Belt-san asks to take the wheel against his doppelganger. The Promised Gang grow weak as they finish their power transfer. But suddenly, the Sigma Circular emits a large, powerful wave. They think this is the beginning of the Global Freeze, but suddenly, the Sigma Circular zaps and surges at Medic. Banno laughs and tells Heart that it’s okay. Medic is just going to die. He explains that the Sigma Circular is not a controller, but actually a device to absorb and amplify the Ultimate Evolution power. With all the power stored in it, Banno would have complete control over all of it and can initiate the Global Freeze by himself. But to deal with the surplus energy, he programmed Medic with a brainwashing operation that would allow her to absorb the excess and act as a countercurrent. Heart is livid. 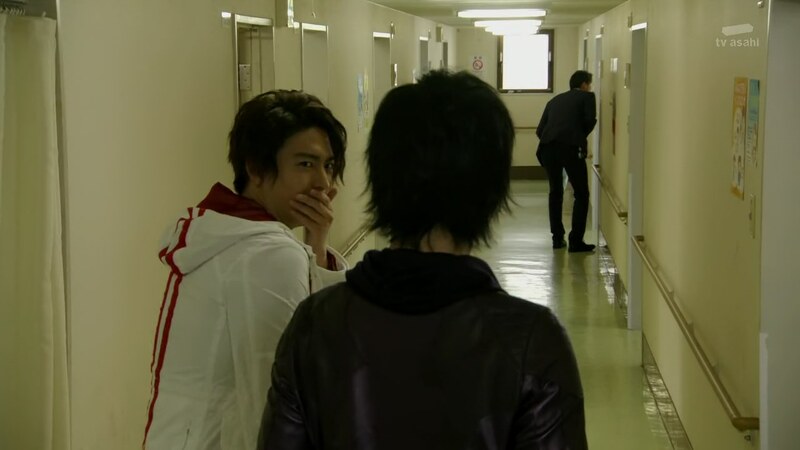 But Banno continues cackling at the beauty of his plan. Without Medic, they won’t be able to revive. And if they fight him, he can easily put them down. And this is all thanks to 004 taking on Krim’s intelligence. Brain takes the programming from Medic and implants it into himself. That diverts the Sigma Circular current from Medic to him. The defiant Brain absorbs the last bit of energy from the Sigma Circular, causing a large explosion. All back in their human forms, Heart and Medic crawl towards Brain. He laughs, relieved. He knew if he transferred the burden of the programming to him, Medic would return to her normal self, free of control. Heart now understands this was Brain’s plan the whole time. Brain breathes his last mechanical breath and disintegrates as Heart touches his face. Heart and Medic are beside themselves in despair. Banno starts cackling some more. Shinnosuke takes over from Belt-san. 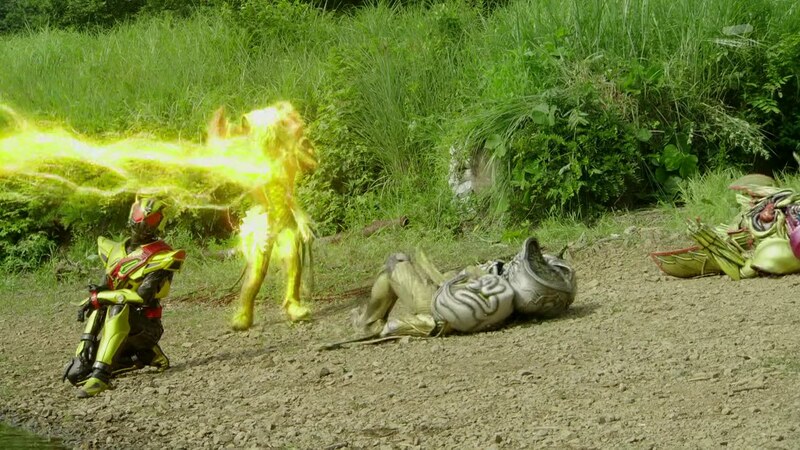 He charges at Banno, but 004 fights him off. 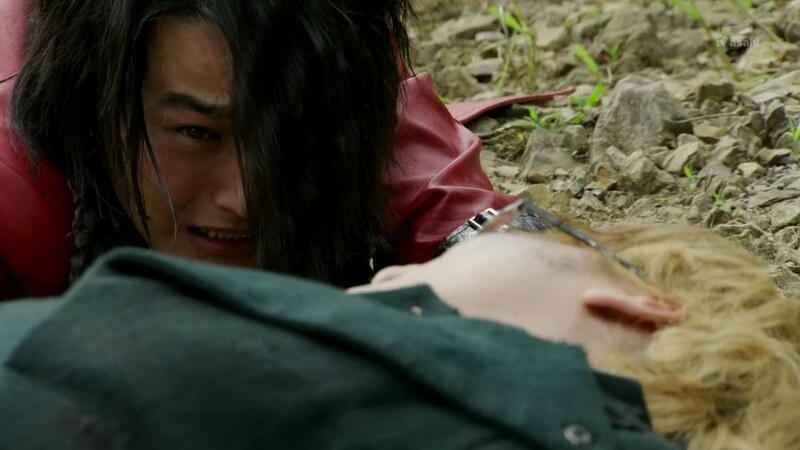 Gou and Chase get up and fight off the other Roidmude who have come to help. 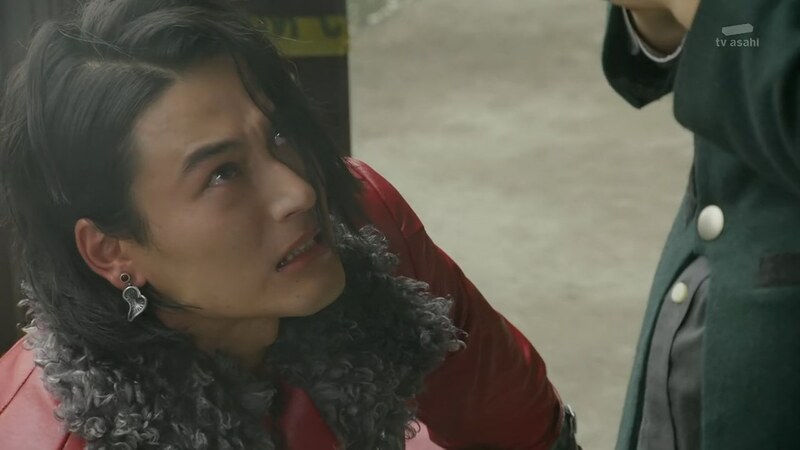 Gou hates the Roidmude, but he is pissed at what he has just witnessed. 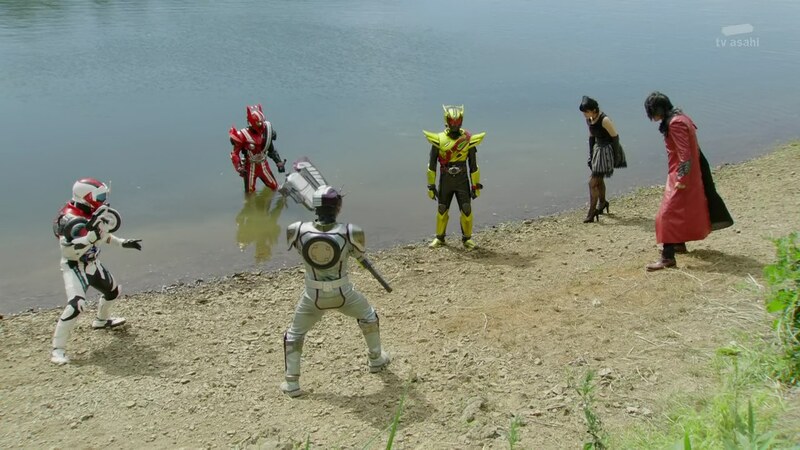 Shinnosuke shoves 004 into the water and delivers a Tire Mix attack while Gou and Chase take care of the others. Banno continues his heaving cackles. 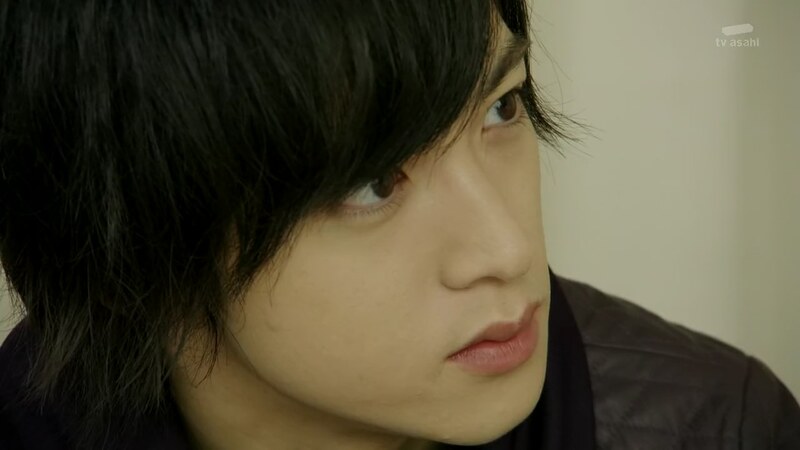 Heart tells Shinnosuke that he will not allow him to kill Banno. He wants to do it himself. Medic too. They surround the asthmatic hysterical Banno. But 004 emerges from the water. He explains that this is not Israel the Promised Land. It was just to lure everyone here. A trap! Banno takes the Sigma Circular and admits that he was Mr. X. He traps them all in some kind of electromagnetic field. 004, also in the field as per the plan, acts as a suicide bomber and happily blows himself up to kill them all. Otta screams over to them as Banno prepares for the true Global Freeze. My repetitive regrets aside, I thought this was a pretty good episode. Of course, it would’ve been amazing if things worked out differently, but I definitely liked this anyway. I actually really cared about Brain dying because he really was the most developed, relatively speaking, of the idols. So seeing him sacrifice himself for the guy he loved (which is really one of the few season-long threads they actually stuck with) was effective and it played out well these last few weeks. But again, that just brings attention to the idea that they should have really played up and made this Roidmude-to-human angle a much bigger part of the overall story. The Roidmude slowly going from machine to human, but of course all of them falling just as they’ve achieved their own bit of humanity. Wouldn’t that have been an awesome journey to watch? Very exciting and possibly emotional. Just more ball dropping I guess. 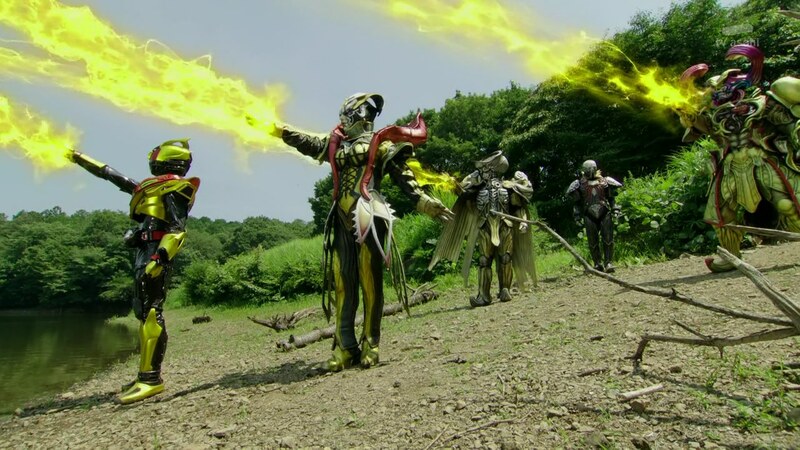 They also should have slowly planted the seeds for Banno earlier in the season. Have Gou and Kiriko maybe remember him from time to time or their family life. 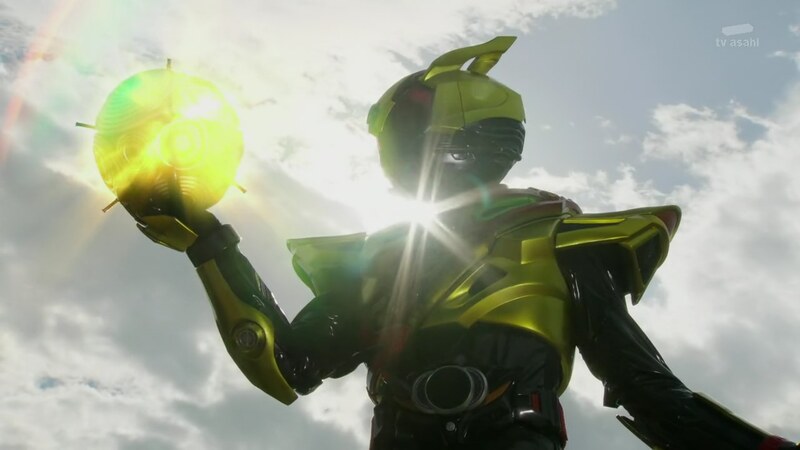 Or even make it a little more overt that Gou was hiding something, but earlier and then shift the “Banno is evil” reveal a little earlier as well. Banno’s cackling was awesomely chilling, but even more so if there were more build up to him being a big bad. It would also make the betrayal and stuff like Medic getting attacked be very powerful. They could’ve easily shifted all the “work” the idols were doing toward their nonexistent endgame to Banno instead. And that would’ve then allowed them to do longer focus on the humans the idols copied and relating that to Heart, Brain, Medic and even Chase’s inadvertent quest to become human themselves. And in other things to nitpick, it was pretty obvious Brain had something up his sleeve in surrendering to Banno. Just as it was very obvious that Mr. X was Banno in an effort to set up a trap for the SID/SSDC/cops. Like really, they didn’t question how in the world someone, other than an actual Roidmude, would know where the Promised Land was? Come on! 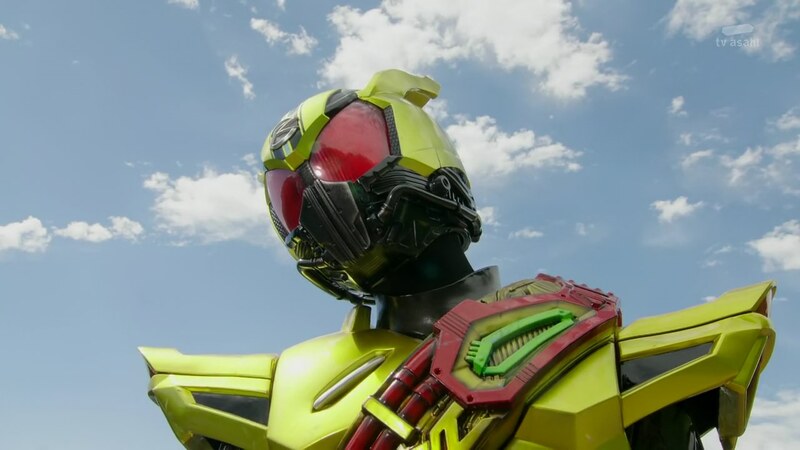 Okay, so I would definitely have to laud Masakazu Morita’s (and whoever Gold Drive’s suit actor was) performance as Banno. That maniacal manner off speaking and laughte was just awesome. But that’s just about it. Again, this episode feels all over the place in the tone department. That attempt at rom-com just feels so half-hearted and Shino and kiriko are reduced into goofing lovestruck teenagers (and even worse, without any proper setup at all). 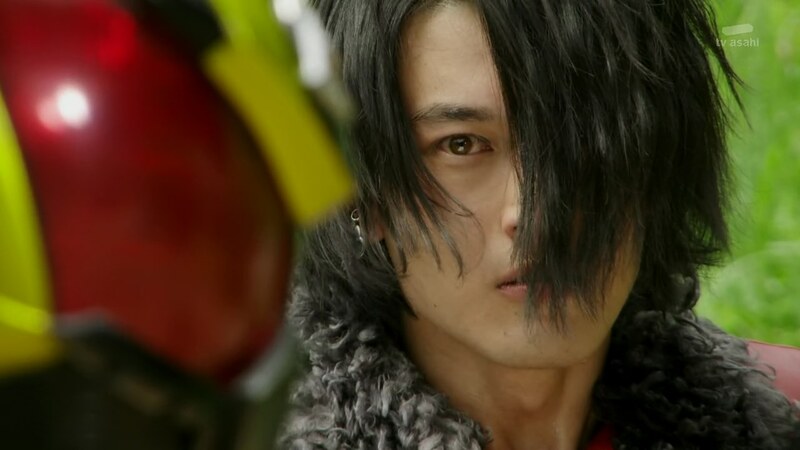 Kamen Rider Jun though, I like. 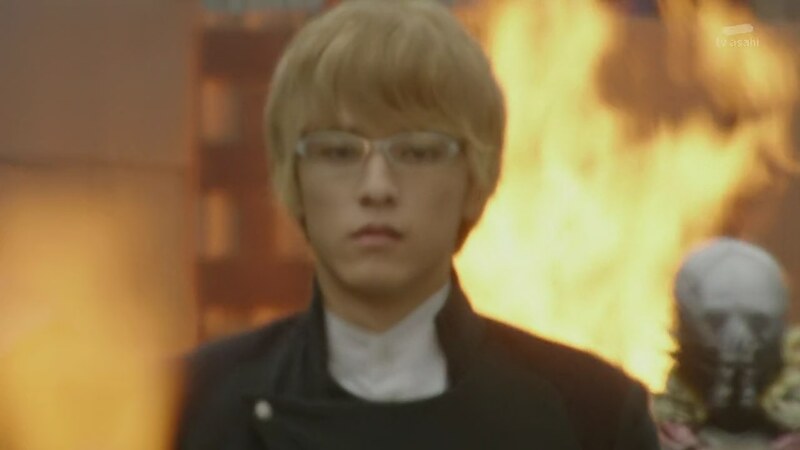 Still I wish to see Captain Jun shown in a more competent light than this. And then there is Brain’s death. I dunno, I just can’t feel as much sympathy as I wanted to. Medic crying over him just left me wondering. When the hell did she even get the ability to weep or feel sadness? She was not shown to have that before and neither was it said that she gained it from the emotions she gathered from other roimudes. That story wou7ld hyave really been a great prelude for this one. With Medic, maybe we’re supposed to assume she got those “positive” emotions when she reconnected with the girl she copied. Off-topic though, have you been watching PSY? I’ve read comments of people, including fans of the big loveteam, are disappointed with it or something? Not exactly watching. Just overhearing it as the folks here are watching it. Like I already said it is just a sad clieche-fest that doesn’t innovate on the original series. Again, if you will allow me to contrast it with the Mara Clara remake (which I consider as the best one they did. But, yeah, I know your opinion about that show). What’s really intriguing and great about the 2nd mara Clara version is that it deconstructed and heavily analyzed the tropes the original had. Thus, we got a blurring of the distinction between api-apihang bida Mara and malditang kontrabida Clara. Mara has her own deplorable actions not usually seen in her character archetype and Clara was shown to also be vulnerable and fragile. They even have one scene where Mara pointed out that she can be just as evil and hateful as Clara. The current PSY doesn’t have that intriguing discussion. It’s characters are pretty much just cardboard cutouts of the original characters. And its plot is full of overused cliches that feel like the writers aren’t even trying anymore. And don’t even get me started with the lame performance their lead act6or does. There is a big difference between subdued acting on one that does not even try to inject emotions to his dialogue, and that actor is pretty much the latter.